themselves, such as educational opportunities, committee work and other activities. These opportunities give Carewest employee the chance to have a say in what is happening within Carewest and to develop both personally and professionally. Our staff work as part of a team, sharing information and offering ideas and suggestions for improvement to care or the workplace. 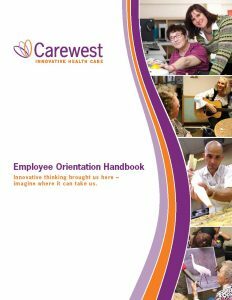 We also encourage employees to take initiative and responsibility for their own jobs, and having a personal voice in their career at Carewest and pride in their accomplishments. Our staff are hired for the skills and knowledge that they possess; but are also hired for their attitude and heart. The technical part of the work we do needs to be done well. Clients need to receive the appropriate treatments and therapy, excellent personal care, the correct medications, meaningful meals, and engaging social or leisure activities in a safe, clean and well-maintained environment. How we do these things is equally important, which is why all our staff are encouraged to bring their hearts to work in support of Carewest’s Philosophy of Care.